Run a half marathon in two hours. 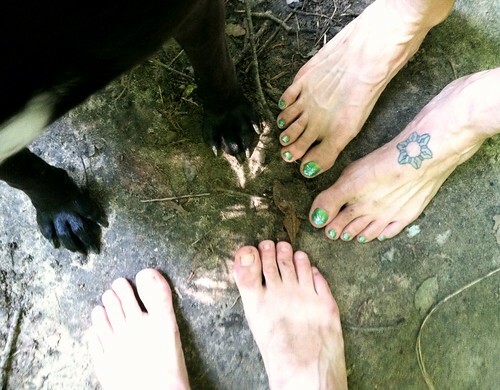 Hike on the Art Loeb Trail in North Carolina. Make at least one recipe each week from one of my actual cookbooks. Judge less. Look deeper. Understand more. Rediscover all the best things about Indianapolis with Karl, because he lives here now. Go outside, even in the cold, because I own a First Ascent coat now. Visit one place that I love and one place that I’ve never traveled to before. Run long, run far on the weekends for fun. My first instinct was to spell busyness like this: business. Then I realized that’s an entirely different word. This post is about business, the business of my life for the past few months, but business sounds very coat and tie and heels, and, well, I’ve been busy, but I haven’t been business. I’ll never be business. Being busy. That’s where I’ve been. Busy living my life and not telling you about it. Busy testing cupcake and salad recipes for bridal showers. Busy being an editor again while being busy being a marketing director by day. Yeah, that’s right, marketing director by day, editor by night. I am a super hero. Busy running my brains out, racking up the miles, looking to 26.2 miles in November. Busy making pasta with fresh peas from my garden and drinking bourbon ginger ales. Busy cooking brats over an open flame. Busy exploring my city like I’ve never lived here before. 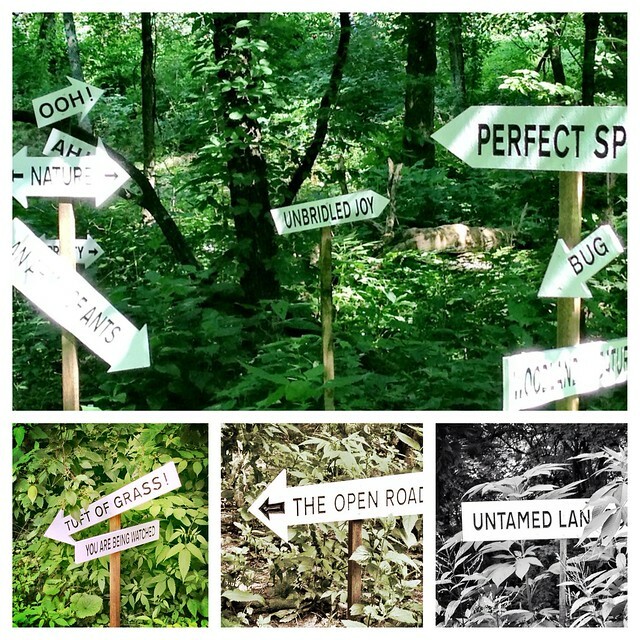 Busy following the signs. Busy drinking good beer, listening to good music, and watching fireworks explode in the night sky. Busy doing all this with this guy who keeps me busy every day with thinking how lucky I am to have bumped into him in this busy sea. Busy. Have to remember to stop and take a breath sometimes. Take a breath and look up at the stars and the moon, dip your feet into a lake, watch relationships being built. Enjoy a cup of coffee, or three, with the person you love while the sun shines down. Take a breath and remind yourself why you’re doing all these things that keep you so busy. This relationship, even though it requires some driving, is inspiring and makes me believe in so much again. That second job surrounds me with people who are strong and courageous in a way I am certain I could never be. They are my heroes. The busy is worth it. Every second. So maybe you’re busy, too. Summer can be like that. It’s a funny season. The air is hot and thick, and the days are longer. 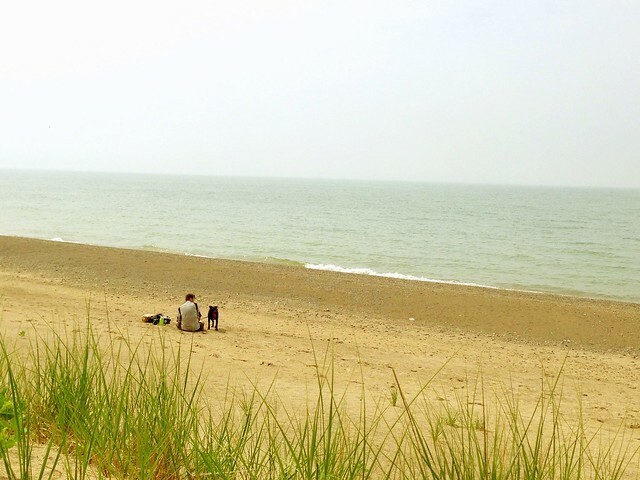 Everything points to slowing down, yet summer always seems to be full of activities, of trying to cram as much into these warm, lazy days as possible. 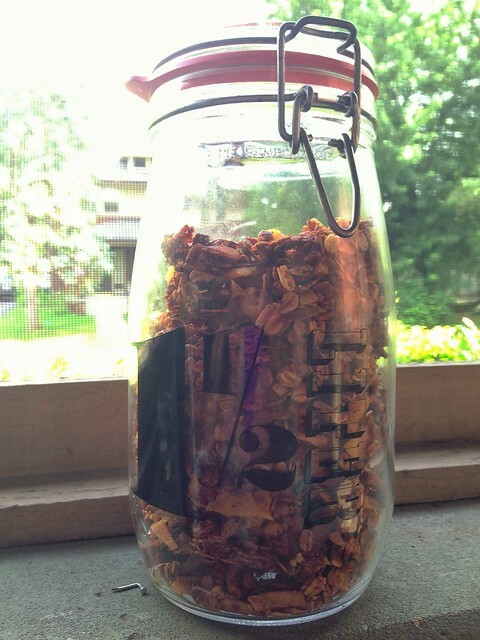 This summer I’ve discovered the best food: homemade granola. It’s not crunchy and granola as in you’ll be a hippy making your own granola in your oven. It is crunchy and granola as in it bakes up into clumps of sweet, oaty goodness that wants to be covered in almond milk, yogurt, fresh summer berries, and really eaten right from a jar. 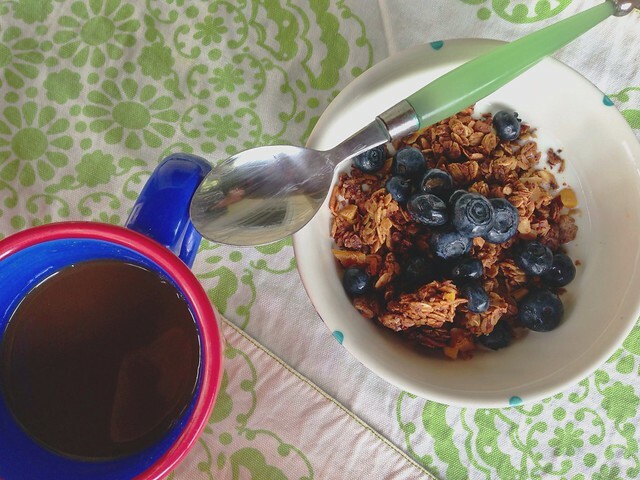 Did you know that granola is ridiculously easy to make? It is, and I feel someone really mean and selfish has been withholding this beautiful knowledge from me. Granola takes one bowl, one spoon, a measuring spoon, and one baking sheet to make. It doesn’t even take measuring cups if you have a kitchen scale (and I say, get a kitchen scale, because it’ll make you love cooking even more than you already do, and it’ll make all your measurements so much more accurate. Deb convinced me with her cookbook full of ingredients in weights finally.) This granola unassumingly sits in your oven, filling your house with a cinnamon maple smell. The hardest part will probably be finding unsweetened coconut flakes. (I found mine at Whole Foods in the baking section.) 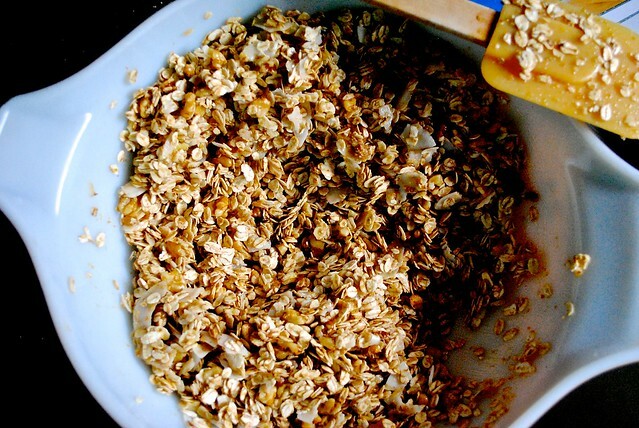 The second hardest part will be believing that you made granola that sticks together in lovely clumps. The secret is the egg white (or 3 tablespoons of water + 1 tablespoon of flaxseed if you’re the vegan type). In between all of the rushing around I’ve been doing, I manage to always make batches of this granola. My big glass jar is always full of it. Trust me on this one. I would like to give credit where credit is due. 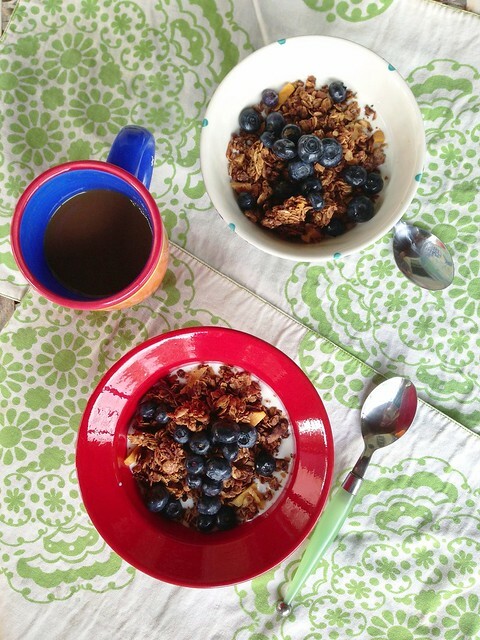 The food styling in these granola, yogurt, and blueberry photos was all done by my boyfriend, Karl. I got a ridiculous amount of pleasure watching him lean over the bowls and carefully sprinkle granola over yogurt and place berries on top without any guidance from me. Combine all ingredients but egg white and dried fruit in a large bowl, tossing to coat evenly. Whisk the egg white in a small bowl until frothy. Stir into the granola mixture, distributing it throughout. Bake for 45 to 55 minutes. About halfway through the baking time, use a large spatula to turn over sections of the granola as carefully as you can. (I break the big chunks up accidentally often and sometimes lose track of what I’ve flipped. It’s OK. Flip the majority as best you can.) Rotate the pan. When the granola is evenly browned and feels dry to the touch, transfer the pan from the oven to a cooling rack. Cool completely. Once it’s completely cool, break up granola into whatever size clusters delight you. Sprinkle in dried fruit. This granola will keep at room temperature in an airtight container for 2 weeks. It keeps even longer in the freezer. Last time I posted I think the season could still be considered summer. Now we are knee deep in autumn. This is totes my favorite season. Changing leaves, cool weather/perfect running weather, cozy food, and art contest prize delivery trips! Michael and I ran in a 5K with a few of his friends earlier this month. I have yet to run a race in my FiveFingers, a goal I set for myself in the spring to reach by the end of the summer, but this 5K was amazing. 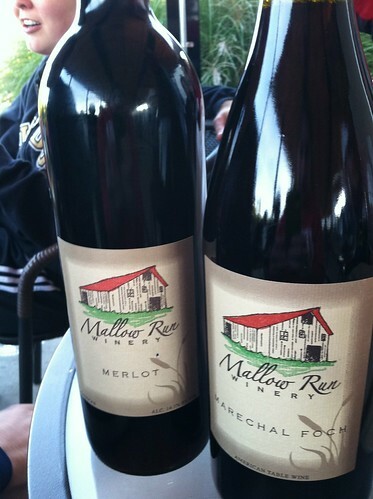 It was at Mallow Run Winery, a bit south of Indianapolis. Firstly, I’m super happy with my time of 24:25. Guys, that’s a 7:52 per mile average pace! That’s under 8 minutes! These are things I never thought I’d say about myself as a runner. Secondly, we got a free glass of wine after the race. Thirdly, we tasted various wines after our free glasses. Fourthly, we bought two bottles of wine per couple and sat on the patio and enjoyed many glasses. Wine and running and friendly people are a good combo! In the last month my magazine’s amazing art director and I have traveled to three cities to deliver prizes for our art contest. Do you have a kid? You should so enter! Multiple perks to these trips include: making the day of a kid and his or her family, giving money to art programs in schools, getting to visit awesome cities! San Diego. We visited the San Diego Zoo. Oh mah Gawd, it was worth every dollar of the $40 we paid to get in! We ate cupcakes two nights in a row. We saw seals. 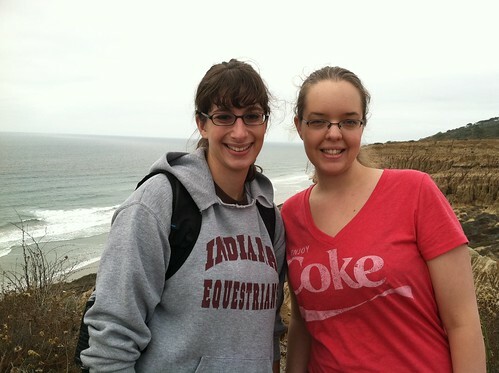 We hiked on the beach And we saw Erica! I went to high school with Erica. She moved to L.A. for college and is still there. I’m glad we’ve stayed friends despite miles and time. The kind of weird thing about this whole trip is that most of the time it was cloudy. I thought San Diego was sunny almost all the time. Knoxville. We had a hotel…disaster…horror story…grossness…long story short, the hotel was terrible and we ran at 11:30 at night. Before we broke free from trucker hell, we wandered around downtown Knoxville. Jen had a contact emergency that took us to this little grocery. 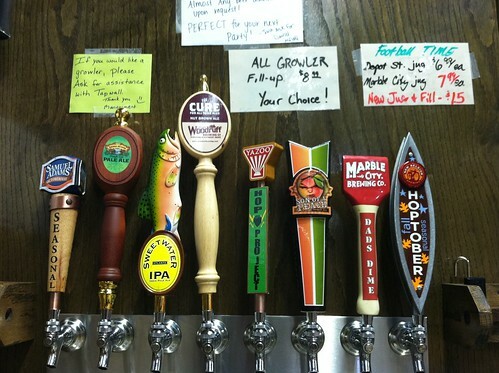 They had growlers and eight beers on tap IN THE GROCERY. Like a little bar in the grocery with awesome beer! I died a little. Just one more reason the South is superior. Kalamazoo. The Bell’s Brewery is located in Kalamazoo. Oktoberfest is in season. 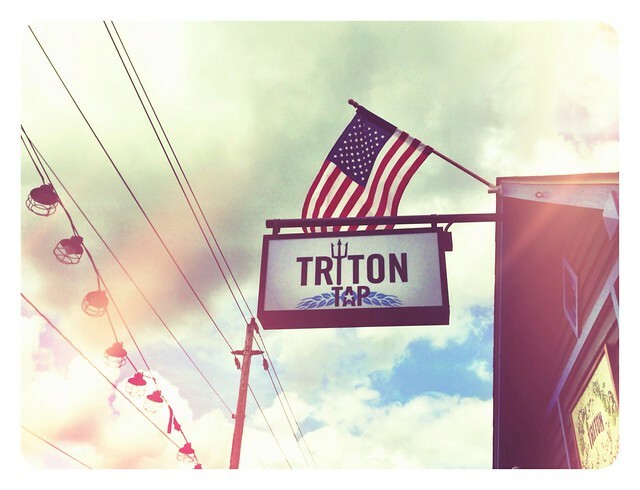 Have you had Oktoberfest on tap at the Brewery that it comes from? Holy amazing caramel-flavored beer awesomeness! 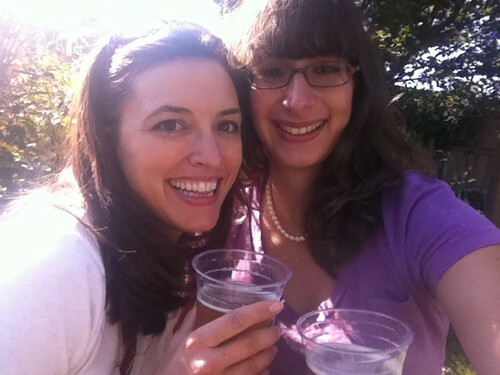 We sat in the bier garden and enjoyed some pints. I left with a six pack of Oktoberfest and a variety six pack. So cozy autumn food. It goes well with Bell’s beer. It goes well with cool weather. Unfortunately we are having some sort of Indian summer during the days. 70s and 80s, what? I don’t care. I’ve been cooking roasted chicken, potatoes, and butternut squash (which, sidenote, is amazing, sweet, and creamy just diced, salted, peppered, and nutmeged, and roasted), vegetarian chili, and a new soup, coconut curry noodle soup. 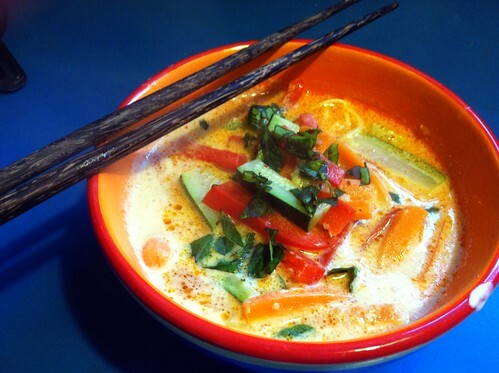 This soup is coconuty, spicy, flavorful, and I love the slurpy noodles. I actually managed to eat most of the soup with chopsticks! As is, the recipe is vegetarian, but I’d say add in some chicken or shrimp if you so desire. One of my favorite soup perks is how it lasts for multiple meals. This one gave me two dinners and two lunches. Plus, it was insanely affordable. I got my ingredients at the farmers market and an incredible international grocery in town called Saraga. They have a whole aisle practically of curries. And all sorts of produce from around the world. And all of the exotic food that costs a fortune at the regular grocery cost half the price. I think overall, this meal, or four meals, cost me around $10. Seriously, guys. The recipe calls for Singapore noodles, but you can sub any rice noodle. Laksa paste is a type of curry paste. I found a jar at Saraga, but if you can’t, just go for any curry paste available. As for vegetables, I used a carrot, a zucchini, and a red pepper.